Color Obstacle Rush - the Funniest Run on Earth! Energize your body with all the elements you may think of! Five kilometers of rush, colors, fun obstacles, music and what-not. 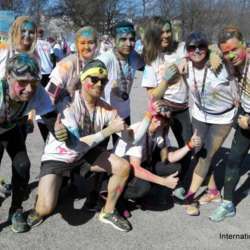 The first Colour Obstacle Rush was held in Finland in Protected content the Finnish name 'Variestejuoksu'. The Protected content became the most popular obstacle run series in Scandinavia. With the inaugural season being a smashing success, it has been expanded to the US and Europe since Protected content even more countries to come in this year. More info on how and when we register comes soon. Meanwhile, check our previous race photos, it was indeed fun! Looking forward to this fun and healthy event!